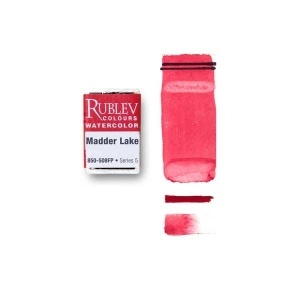 Rublev Colours Alizarin Crimson is a translucent bluish red with high tinting strength, fine grained and a 'short' buttery paint. Rublev Colours Alizarin Crimson is ground in linseed oil without the use of stearates or other additives that affect the behavior of the pigment in oil. The pale linseed oil used to make this color is well aged and refined to provide higher levels of reactivity and oxidation than raw oil. The consistency is a smooth, thick, rich color that is 'short' and buttery. Note: The color swatch was created using a thin tint mixed with an equal part of linseed oil (left), solid thick application (middle), and a solid tint mixed mixed with an equal amount of white (right) applied on acrylic primed canvas. All pictures of color swatches in this web site are only approximations of the actual color of the oil paint. We have taken every care to match the color in these pictures on calibrated color monitors to the actual color. However, because of the wide variance in color monitors the results you get may vary. Although assigned to lightfastness category II (ASTM D 4302), alizarin crimson may be considered as a permanent color under certain conditions. Franz Hals was well aware of the correct way in which to use fugitive lakes in order to produce vivid flesh tints. The ruddy noses and rosy cheeks portrayed by him which after a lapse of centuries have shown that this color, when intelligently used, is stable. According to Maximilian Toch (Toch, 1911), if madder lake (the natural lake pigment related to alizarin) is used as a glaze over a color which has been allowed to dry thoroughly, it will remain permanent, but if mixed with any mineral pigment, such as ocher, lead, sienna, etc., it is altered and loses color. This Toch based on his observation of Rembrandt's use of the color in works like the Anatomy Lesson, in which 'upon close examination the flesh tones have suffered very likely due to the fact that the lake used in glazing was mixed with the under-coat.' 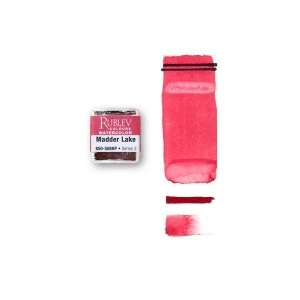 Based on this observation it is, therefore, reasonable to assume that alizarin or madder lakes should be used as glazing colors over a properly dried surface. Alizarin or madder lakes will not decompose when mixed with various blacks such as bone black, lamp black and carbon black. Vermeer more than once placed a glaze of lake pigment over vermilion. He first modeled the object to be represented in various tones of vermilion using white to lighten the tone and black to darken them. Once the area was dry he glazed over it with a lake. Madder lake may be mixed with iron oxide pigments that have been calcined, such as Indian red, which when mixed with this pigment forms a color known as Tuscan red. It may also be mixed with burnt sienna, burnt ocher, burnt umber, etc., but is fugitive when mixed with raw ocher, raw sienna or raw umber. The chemical colors like lead white, zinc oxide, chrome yellow, Naples yellow and chrome green cause it to fade, but colors like vermilion, cadmium yellow and all of the blacks do not affect it. The safest way in which to use it is as a glaze over a ground that is thoroughly dry. Madder lake deepens considerably when placed in a dark place, but is revived when subjected to bright sunlight.